Excel heat maps made easy! With the recent release of version 8 we’re going to blog about a number of the new features, starting with how to create a heat map in Excel. There’s a lot of data here but it’s not giving us any helpful information as the table is too large to see any pattern or comparison. A heat map could be a useful way to give a quick visual picture of the spread of the sales volume. 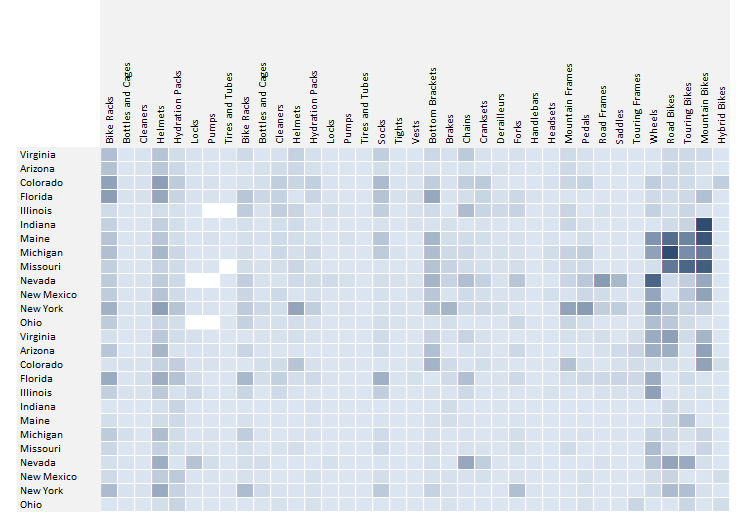 Let’s add a simple heat map, new in version 8 of XLCubed. As we have already selected the data area to be charted this prompt is already showing the correct cell locations. 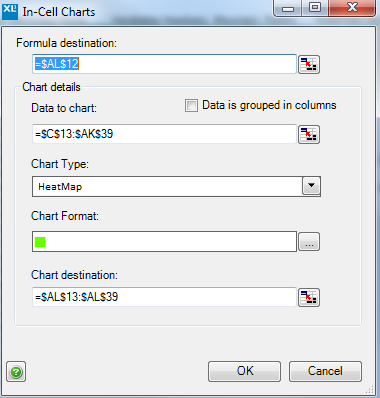 Choose the formula destination (where the formula controlling the chart will be located), and the Chart destination (where the top left cell in the chart area will be located). We have set the low and high colours to define a blue colour gradient. Outlying values could potentially skew the chart so you have the option to exclude these by setting minimum and maximum values. 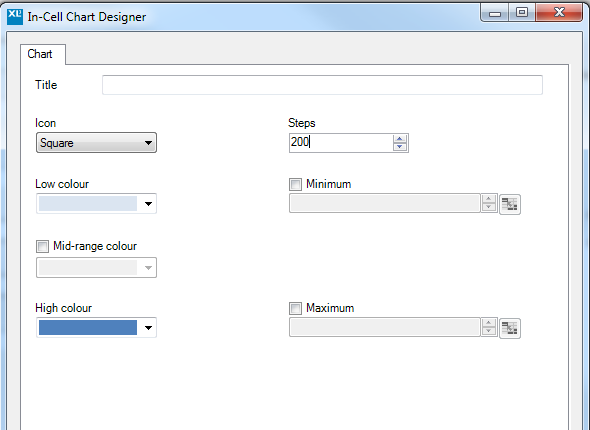 Select the icon to use, squares in our case, and the number of steps or bands to split the range of values into. You can now quickly assimilate the spread of values in a glance, and note the higher sales volumes in Maine, Michigan and Missouri for Road, Touring and Mountain Bikes. To alter the formatting of the chart simply double click on any one of the squares in the heat map, or on the chart formula to bring up the formatting dialog. If you are not already a user of XLCubed you can get started with an evaluation of XLCubed by going to our registration page. Next ArticleWorkbook slicers – all for one and one for all!